A dementia caregiver, or a caregiver who takes care of one or more patients with dementia, can be a very challenging task. They usually need lots more attention than patients who are fully alert and oriented. The rise of aging baby boomers is likely to increase the amount of these types of patients over the next few years. A simplified definition would be when a patient's brain is not as strong as it once was. They often get confused and disoriented. Many of them have the mindset of a child or are not able to communicate at all. Some of them seem to follow a specific pattern of confusion while others can be completely unpredictable. 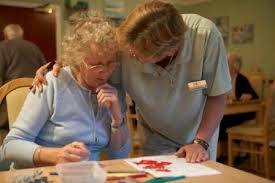 There are many different kinds of dementia, the most common one being alzheimers disease. Others include vascular, lewy body, and sundowners. These patients have a much higher fall risk than others without dementia. In many cases, the confusion gets much worse at night or what is commonly known as sundowners. For this reason, these patients often need to be watched extra carefully at night. There are a few things you should do in order to make sure these patients do not get hurt. First of all, if their bed has a bed alarm, it should always be on. If the patient is in a chair, use a chair alarm. If the patient tries to get up, someone needs to be there. Otherwise they could get into something that could harm them such as a sharp object or electrical outlet, or more commonly, they could fall. Some of these traits may at first seem harmless, but oftentimes, these patients can become dangerous. Some don't realize they are hurting themselves or others while some patients may even become combative. Situations like this can be extremely tricky. When a patient becomes combative in the hospital where I am employed, a code gray may be called. This will send security guards up to the patient's room to attempt to calm them down or even restrain them if necessary. I have had patients hit, kick, bite, and try to use objects around them to threaten or harm me and other caregivers around me. In situations like this, sometimes the best thing to do is step back and try to keep the patient contained as much as possible so they don't harm other patients or caregivers. Try to keep them in their room, especially if other patients are around. If you are caring for a relative at home when this happens, you may have to call for help. See if there is another relative that can help calm them down. Some patients react differently depending on who is there. Or you may just need someone to help protect you and your family member from harming themselves. Use you resources. If things get to be too much, you may want to consider a long-term care facility such as a senior living home. As a dementia caregiver, it can be difficult to communicate with your patients. Some of them talk about things that have nothing to do with the situation at hand. They may not know where they are, who you are, or even who they are themselves. Some may not even be able to communicate at all. If your patient is not making much sense or believe to be somewhere they aren't or doing something they're not, it may be best to just go along with what they are saying. You can sometimes tell them where they are and what they are doing but oftentimes, they will refuse to believe you and may even become upset. I have often told patients the situation they are in and have even shown them proof that what I was saying was indeed true. Despite all of this, some of them still denied that I was telling the truth and became irate because they felt that I was lying to them. If this is the case, just agree with them so they feel better. These patients may struggle with bathroom assistance as well. Many will even become completely incontinent. If this is the case, it may be a good idea to have the patient wear an adult diaper, especially at night. If they are not able to make informed decisions for themselves, they may have a durable power of attorney for health care to make important medical decisions regarding their care such as do not resuscitate orders. Some patients with dementia just need something to do. If they don't have anything to occupy themselves, they may search for something to do which could lead to trouble. Instead, you could find something for them to stimulate their mind with. There are packets of items called dementia kits to help with this. These items are pretty simple things, but can be a life saver for these patients. If watching television isn't keeping them calm and you aren't able to keep a close eye on them at all times, one of these packets may be just what you and your patient needs. At the hospital, we sometimes find things for our patients to do. They may just want to be around others. If the patient isn't combative in any way and just wants company, we will sometimes put them in a wheelchair and set them next to the nurses station. This usually calms them down and nurses are still able to work. Another tactic is to give them something to do physically. One trick is to give them linens or caregiver scrubs to fold. I have done this myself and it works like a charm. Whenever they finish folding the linens, thank them for their help, leave the room, unfold the linens you just gave them, and give them back to them to fold over again. They won't know the difference and can be done over and over again. 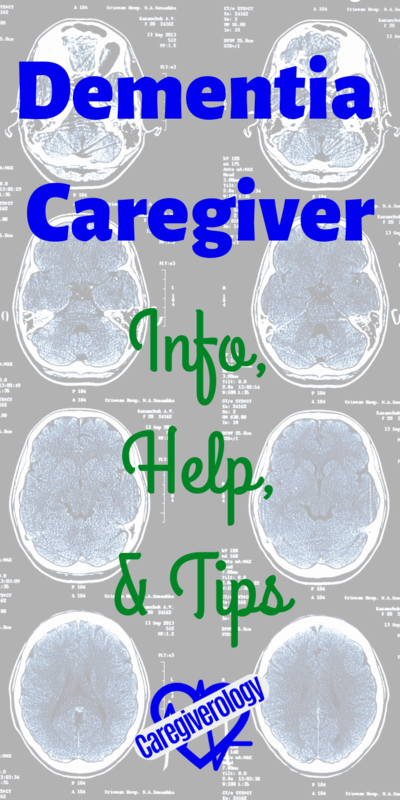 Being a dementia caregiver can be a real challenge and can cause a lot of stress. Give these patients as much care and attention as possible. If you don't know what to do in a certain situation, seek help. Some caregivers have more experience with these types of patients than others.